Blanc-de-Chine, or white porcelain, is probably the best known product of Dehua, situated in Fujian province, accross the straits opposite of Taiwan. The white porcelain was and is one of its main products, however, production in Dehua was never limited to white porcelain only. The cause for the whiteness of Dehua porcelain is its very low iron content, resulting in a pure, white appearance. 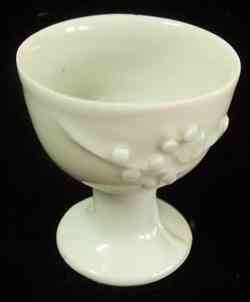 Well known among western collectors are also the white Dehua libation cups with their unique carved shape. But there are other cups, like stem cups, tea cups, etc. In the past a large part of porcelain manufacture at Dehua kilns consisted of white figures/figurines, especially religious figures like the Boddhisattvas Guanyin and Maitreya, as well as Arhats (Luohan) and Bodhidharma figures. Apart from these, white censers are also a well known product of this kiln. White porcelain was never limited to Dehua items. However, though other kilns also produced white items, Dehua's white porcelain was paralleled by few. Towards the end of the Qing dynasty the pure white clay and glaze lead to even whiter products. In Japan, Dehua white porcelain was also renowned for its Buddhist porcelain figures, despite the fact that such figures were also extensively produced in Japan's Hirado and other kilns. Dehua and Hirado white figurines can easily be distinquished by their bottoms. The Japanese figures usually have a closed base with only a small hole for ventilation. Additionally, Hirado wares also may show a tinge of orange on unglazed areas. In contrast, figurines from Dehua generally have an open bottom.